Once this synth app "clicks" and you realize what you have in front of you, it just might be your new god. The 2.0 update is spectacular. Great work from a great developer. Thank you 4 your hard work Bit Shape!!! The most unique synth on IOS + Great sound + Audiobus = What the heck r u waiting for buy it!!! Seriously this app rocks and is a must have. My mind is blown by this app! It is so intuitive to play, yet such a powerful, complex and truly original synth. The interface is very elegantly designed and the sound quality is very nice. I highly recommend this one. Very deep synth with a made-for-touch interface. TC-11 takes full advantage of the touch surface of the iPad, and does things no other iOS synth can do. A powerhouse of a synth, with depth rarely seen elsewhere, it's a must if you've got the guts to tackle it. The 2.0 updates have made programming much more user-friendly. There is a LOT to this app, but more a toy than a synth. Visionary design. Opens new worlds of sound design and performance. In a class by itself. Amazing work Kevin! Wow! 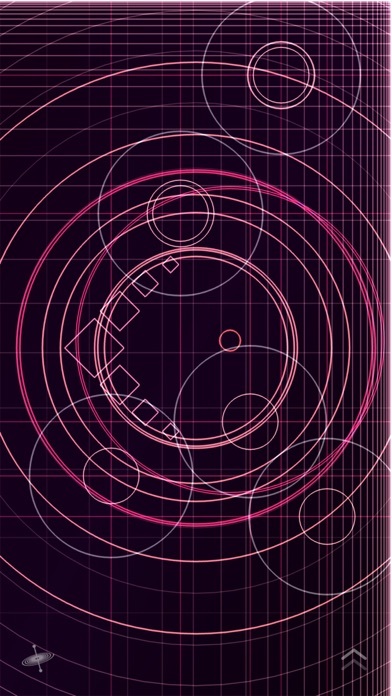 This is an app of wonderment and style! I've owned it since it's first version and continue to find new avenues for experimentation and sound manipulation. Amazing. I've only a few hours with it, but I'm hooked. The presets are a decent starting point, but tweaking and creating new sounds are what makes this worth it. Insane. I love ipad synths. I have many of them. I like the korg, wavemapper, nave, animoog, thumbjam, alchemy, sunrizer, grain science, and the list goes on. But... I just do not see this one being one I will ever use. To me, it's not very functional for what I would need. It at best makes some ambient noises that may be of use to some people. I just do not understand all the rave reviews. For the price (which is very costly) I just can't see it. For a synth, I am not happy. Well, I saw the reviews and figured it was worth the money. It wasn't. Get wavemapper, animoog, alchemy, any korg, sunriser, soundprism, nave, before considering this. There are many other synth apps that cost less and in my opinion quite a bit better. If given a choice, I would love to get my money back and get another synth I don't have. The only reason for two stars is, it doesn't crash. I wish it did, would give reason for refund. Dude ...this thing is DEEEEEP. TC-11 is the one and only TRUELY original synthesizer that looks beyond immitating previous paradigms and meets the potential of the iPad multi-touch interface to create a whole new way of creating and controlling sournd. I liked the original version okay. But programming it was an exercize in tedium. The new patch interface goes a long way to opening up the potential here. Just about EVERYTHING is subject to controller input and there are LOTS of controllers available - something that is SORELY lacking in most synthesizers (both hardware and software). TC-11 includes multiple LFOs, envelope generators, tables, sequencers, etc. 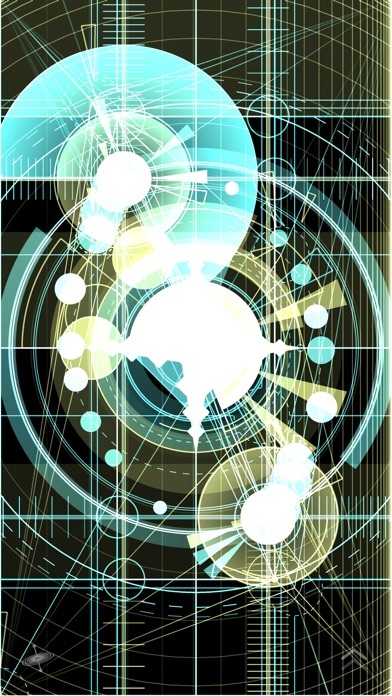 The touch screen can be prgrammed in MANY different simultaneous ways as a controller. The nesting of controllers and intermix of control modules and touch screen input makes TC-11 the match for even the largest and deepest modular hardware synthesizers. TC-11 is the Serge or Buchla of iPad synthesizers. Wonderful stuff. The only weakness is that the audio path is less flexible than the controller paths that you can build in this app. The addition of some new oscilator types helps. Waveshaper, resonator, phaser, multiple filter types, etc. are all good. But routing the audio modules remains fairly conventional. The good news here is that the audio quality is excellent. If you are into deep synthesis, buy it right now. This app repeatedly gave me this chills. It's the new instrument of the future. No strings, or keys. Just touch! Just ourselves in the moment. Oh, the possibilities! I bought this early on in its release and it is still one of the most innovative music apps ever created and one of my favorites. If you want a unique sound and want to understand the future of synthesis then look no further. Best money you can spend if you are into sound design, performance, and sampling. TC-11 is limitless. This sets a standard for how a synth should operate in iOS. Unbelievable controls. Check out their other app too. This was already a fantastic app, but the new update makes purchasing it a no-brainer...new sounds, new controls for changing the sounds, and an all around smoother sleeker experience, plus it's pretty awesome to look at....get it. I really like the rich sounds and cool interface that banishes nobs for good. The only wish I have is that it would support microtonal tuning in some way. Either by loading scala files like Z3TA+ or tun file, or entering and saving by hand. It's the only item I find missing I really had. Great App-Nothing else like it! Also really loving the AudioShare update. Screw AudioCopy; life is too short to deal with its hassles. 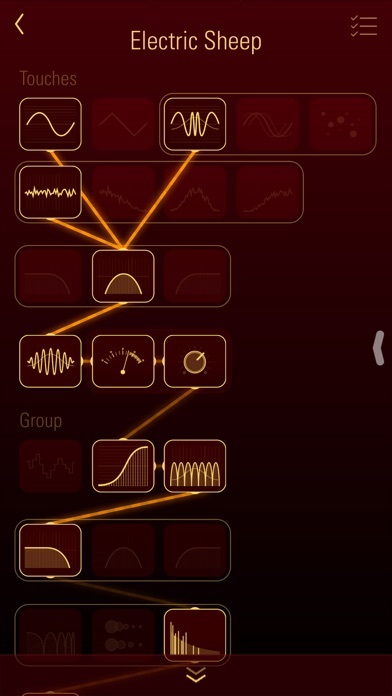 Fantastic Synth / Soundscape app ! Wow, this already incredible app just got an excellent update. Adding granular synthesis and an awesome new patching interface and patch tags. Plus more! One of the most expressive and exciting synth apps available! The TC - what a great synth! I'm glad it still works on my dated ipad 2 and that's WITH Audiobus, Audioreverb, and AUDIOSHARE simultaneously! Sounds awesome. Truly a space age interface. Thanks for making it!! I think the interface has a few creative advantages over a keyboard, but as I went through the included patches I found they ran the gamut from very interesting sound fx and cool pads to kind of hokey simple patches, a lot of which can be recreated on most synths and maybe even moreso if they have polyphonic after touch and other creative modulations, etc. One thing I noticed is there doesn't seem to be any way to play individual notes with any precision like if you wanted to play a repeatable melody, but I haven't dug into programming this yet. All this being said, I thought the price was a tad high, but I give it an 8-9 score for the interface and I'm 50/50 on the patches. I heard there may be a version of this in the works that will use sound samples, hopefully with the ability to load your own sounds in. That is what this app is all about. Perfect fit for the ipad . Congratulations! This synth is unique and fun to play. I love TC-11 but cannot update to the latest version, which sounded awesome from the release notes. I am happy to give $30 for the quality. I'd like to see some more functions such as on board sampler module as an option. one that could record with the mic or line in would really up the anty'. I also feel a solid granular synthesis engine in combination with the rest would top this app off amazingly and vastly expand the horizons and capabilities. the rest is super cool and I can see this becoming even more powerful than it already is. Great work! A huge leap forward in interface and sound... And a developer not interested in letting musicians connect with his toy. Responsive to inquiries, but sample patch provided ironically speaks, "Why, why, why?" I really want to love this synth. As it stands, my creative impulse is thwarted, and my desire to explore is extinguished. I'd give it more stars for sound design possibilities, but as it stands, I feel mocked by this app. Fascinating control leading to so little feeling of control. Love of machine over musician. Such a shame. One of the few music apps that actually takes advantage of your device's touch surface and sensors rather than rehashing some analog instrument. The sound quality is superb. 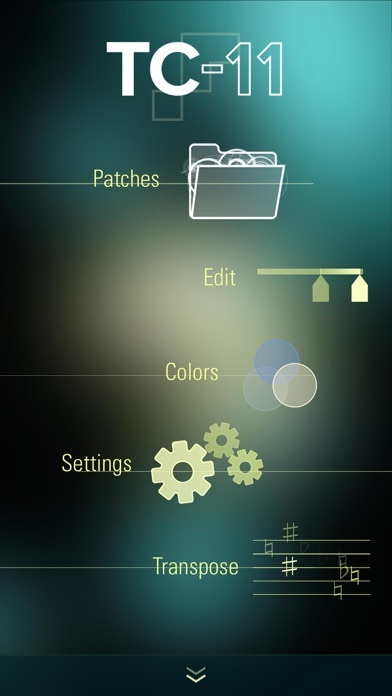 You can build your own patches or use one of the many excellent patches in the app. It plays well with others including IAA and Audiobus. Works on phones now too. Being able to have multiple patches to play at the same time really makes me want to finger my surfaces. This is how music synthesis should be done on a touch device. There are lots of great synths out there for iOS, many of them faithful renditions of emir hardware counterparts. Then there are synths like the TC-11, who show us a whole new way of music synthesis. Way to go, BitShape! What an amazing use of the iPad's technology. This synthesizer is amazingly versatile. The documentation is excellent and accessible. I vividly recall when Bebot was released, anticipating what might evolve. Well, this blows any of those dreams out of the galaxy. Well done! TC-11 is an absolutely amazing app that gives the 'composer/programmer' the ability to create their own custom "Touch Instrument" from a rather standard synth module signal flow, but with layers and layers of customizations possible to take full advantage of touch interfaces. Sources consist of 2 multi-wave oscillators, an FM osc, a "multi osc", and even granular osc plus white, LP, BP, and HP noise. These are followed by LPF, BPF and HPF filters for the individual sources and then an Amp (with additional amp modulation and pan modules). Following this are effects (S&H, waveshaper, and phaser) with a subsequent LPF/BPF/HPF for the mixed signal. Then the whole thing can go through either a resonator, a stereo delay, or a reverb. Controls for all the sources and processors can come from over 300 inputs ranging from individual touches on the screen to the device's gyroscope and magnetic compass. On top of all these devices, there are 4 modules (AHDSR, LFO, Table and Sequencer) that can also be used to control the various synth sources and processors. Actually, you can use up to 8 independent AHDSRs, 8 LFOs, 16 Tables, and 4 Sequencers in a patch. The app comes with a large library of built-in patches to get you started, and there is a very extensive and well-written manual on the developer's website that you will absolutely need to read to get the full benefit from this absolutely amazing app. I have only recently downloaded TC-11 and have spent upwards of 20 hours of my holiday weekend playing around with it, and clearly I've only scratched the surface. If you enjoy tinkering, programming, and getting into the guts of a synthesizer and want to make full use of your touch interface to build a user-customized instrument, this is definitely the app to get. Well worth the price. This app is so deep, I don't have any real improvements to suggest (yet). For me, at this point, it's simply wonderful. Perhaps after another few hundred hours using it I will have some helpful suggestions to pass on to the developer (who, as I understand from other reviewers, is very open to feedback from his users). I hope this review is helpful! I have too many synths to name and I am *not* a keyboardist or a modular synth expert. Unlike some other mod synths programs, this one offers fun and unique sounds without a required learning curve. More than enough presets to enjoy, with very different results. One improvement wanted: easier way to set scales than the current sequencer offers. This app produces the best atmospheric and modulating noise sounds out there. The initial impulse is to go kind of crazy with it but I think it's just as useful when employed subtly. $30 may seem like a lot but it's worth it. Plus it's got a super-high quality resolution that always stands out in your mix. Buy. Use. This is the first review I've ever submitted. As a professional musician, I can say that this is a seriously powerful sound design tool. As a former student of the developer, I felt so much awe and pride after experimenting with this app for 5-10 min., that I wrote him to say so, as well as this review to tell everyone else..... Highly recommended purchase, and I wish Bit Shape all the success in the world! Quite possibly the most interesting iOS synth available. Every penny is worth it. Whoa.... Now this is amazing. Great work. This is one of the most expensive apps I've ever bought, way out of my comfort zone for app purchases. But it was SO worth it. First, I heartily agree with everything everybody says about how amazing the interface is. The developer(s) really put their right brains to work imagining synthesizers and multitouch. Every touch, gesture, even every tip of the iPad means exactly what you tell it to mean. Keyboards are SO last millenium. Second, playing with TC-11 is inspiring, both aurally and visually. 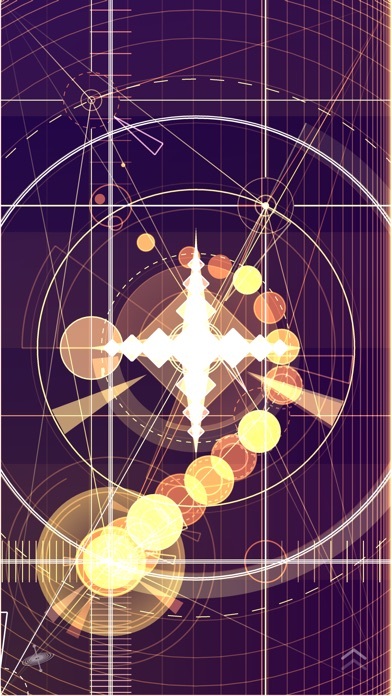 The interface for making music is not only informative ... it's gorgeous. The visual feedback is as much a part of the performance as the sounds you're creating. And just as you can customize the sounds it creates, you can customize the look (within limits) of its animations. And finally ... though it's not usually marketed this way ... this is a splendid app for learning the fundamentals of sound synthesis. I worked through Simon Cann's book HOW TO MAKE A NOISE (iPad Synthesizers Version) using TC-11 instead of the apps the author uses, and I came to understand the fundamentals of synthesis much better than when using the prefab sliders and knobs of any other synthesizer. At the end of my studies, I understand TC-11 much better and I understand the possibilities of synthesis much better. In short, this is an app with real class, something I think Steve Jobs himself would have appreciated as equal to the elegance and class of the iPad. Absolutely worth the money if you really want to explore sound synthesis. Really fun to play, this app offers many ways to interact with the synth and a lot of depth in programming these interactions. The control and variety of sound is extensive, and the use of the touch surface is brilliant. Best thing to happen for synthesizers since Moog. Am I really the first to review this? TC -11 is pretty much the best synth app ever period. One of my favorite ways to make music!